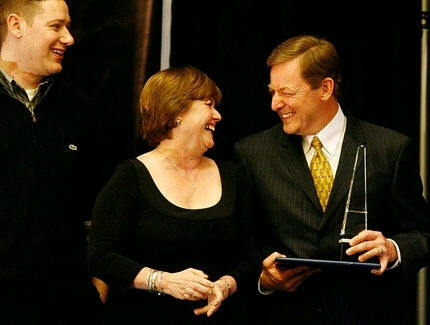 A community advocate for education and economic development was named 2008 Tri-Citian of the Year on Saturday.Mike Schwenk was stymied and teary-eyed at being singled out for his longtime commitment to the Tri-Cities – a place he’s called home for nearly 30 years. “This isn’t about me and this award isn’t mine. I think it’s about all of us and this award is ours,” he said. The Richland resident was joined on the stage by his wife Sharon, their two children Brian and Stacy, and a half-dozen other family members. He was introduced by George Garlick, the 2007 winner, before a record-breaking crowd of 450 at the annual award banquet at the Pasco Red Lion. Schwenk was nominated by Brad Fisher, senior vice president and branch director of RBC Wealth Management, and jointly by Carl Adrian, president and CEO of the Tri-City Development Council, and Karen Blasdel with PNNL’s community and regional outreach. Fisher said Schwenk was the perfect candidate because he “embodies the true spirit of this award … service above self!” He described Schwenk as a gifted community servant who can lead effective discussions and quickly get to the heart of an issue. The event – which has recognized 42 Tri-Citians during its 37 ceremonies – has been organized by local Rotary clubs since 1980, but this year included Kiwanis, Lions and Soroptimist clubs. An independent committee selects the recipient. Schwenk was the owner and operator of General Business Services for two years in the mid-1980s. He has served as director of Fluor Daniel, Westinghouse Hanford, ICF Kaiser International and RL Ferguson and Associates, and was executive vice president of TRIDEC from 1986-89. He is chairman of the Washington State University Tri-Cities Advisory Council, the TRIDEC board and the Three Rivers Community Roundtable, while also serving as co-chairman for the Tri-City Chamber Higher Education Task Force. His lengthy résumé lists numerous organizations and boards, including the Richland School Board and the Richland School District Foundation, CREHST, Columbia Industries, the Blue Mountain Council for Boy Scouts of America, the Washington Export Council and the Leadership Task Force on Sustainable Development. Schwenk has been the recipient of several community service awards, most notably the 2003 Sam Volpentest Leadership Award. The 15 letters submitted in support of Schwenk’s nomination were a who’s who of the Tri-Cities, including WSU Tri-Cities Chancellor Vicky Carwein, Herald Publisher Rufus Friday, AgriNorthwest President Don Sleight, Rich Foeppel, president and CEO of Columbia Industries, and Pasco City Manager Gary Crutchfield. “Mike has volunteered hundreds of hours of his own time, expecting nothing in return, simple because he cares about the Tri-Cities community and its people,” said Kris Watkins, president and CEO of the Tri-Cities Visitor & Convention Bureau.